On to the always-popular (and sometimes contentious) topic of pricing and estimating for freelancers. More specifically today, I want to address the psychological benefits of high estimates via a lesson I learned over the holidays. We recently moved to a ranch built in the 1950s, flanked, like many Phoenician homes of that era, by a couple of stout California fan palms. If you look out our bedroom window, you basically see the bottom section of a 40-foot-tall elephant. They’re close enough to the house, however, that I’m not getting my chainsaw anywhere near them, even though I’m a reasonably experienced lumberjack from growing up in the woods. So, I Googled around to a few companies that specialize in “palm removal” — its own category here in the desert — and asked for estimates. Company A called me within about 10 minutes of submitting the form, and an estimator showed up about 2 hours later. We walked the yard, he confirmed my suspicion that a crane was going to be necessary, and he gave me a price. Company B called back within 2 hours or so. The estimator was looking at the house on Google Maps and could see the two trees. He asked how tall they were, I guessed 40 feet, and he said that it would be X dollars per foot, and that he would counter any competitor’s price. Company C contacted me around an hour later after the other two. He also used Google Maps and a per-foot rate estimate that was identical to Company B. As it turns out, Company A was the highest priced of the three, but was still considerably below my Worst Case Fear number of $1000 a tree. After the world’s shortest discussion, my wife and I agreed that they were our best bet. 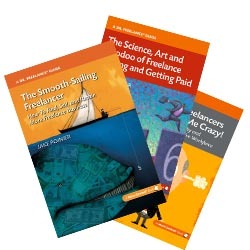 The lessons here for freelancers? Responsiveness counts. I know that there are freelancers out there who swear by playing “hard to get.” That’s fine, but I’m personally more impressed by someone who gets right back to me. Understanding the problem counts. To really gain someone’s trust, you need to know what the specific challenge is. Company A saw in person how close the trees are to our house. He’s not going to show up on game day and say, “Uh, oops, we’re gonna need to go get the bucket loader” or tell me that the trees are actually 50 feet tall and thereby 20% more expensive. Know your competitors’ rates in your locality. It was obvious to me these tree removal companies know exactly how the others price their jobs. Assuming that your talent level warrants it, raising your rates and pricing yourself just a bit above the fray can make you look more trustworthy to clients — always a plus for freelancers. Scaring off the something-for-nothing crowd? Priceless. What’s your personal take on the psychological benefits high estimates? Does it work…or have you ever had it backfire? Ahh, the old playing hard to get routine. That’s like racing over the edge of cliff: even when you win, you lose. And I would have chose the first guy too. I’m the kind of person that often needs stuff done a very tight schedule so if you’re the one who answers first and is somewhere in the budget, you get the job. Yes, P.S. — and unlike The Roadrunner, you can’t just pause in midair and flit back to the edge of the cliff once you realize your mistake. The tree guys came in at 8 this morning and have already removed both trees with an enormous crane. Pretty exciting, if you enjoy that kind of stuff! I was just talking to a fellow designer about this just today. I told her it’s always good to bill a little higher and but respond quickly. That will always give you the edge. I don’t know any designers who play hard-to-get but what a dumb gimmick. Show interest in the project and respond with a great proposal. That’s it. Great post. Thanks for commenting, Dennis. I’ll admit there are many ways to run a business, but I think the straightforward approach is the best!